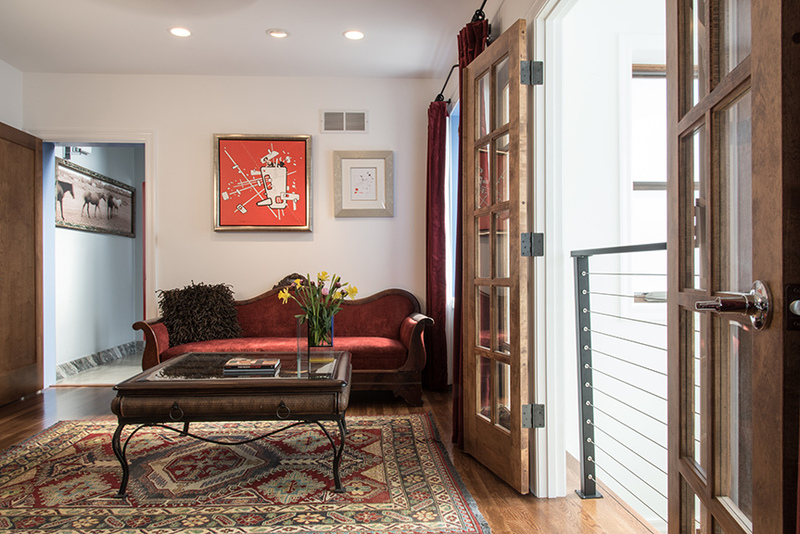 Designed around the owners' extensive art collection, this Tower Grove townhouse is as vibrant as its residents. 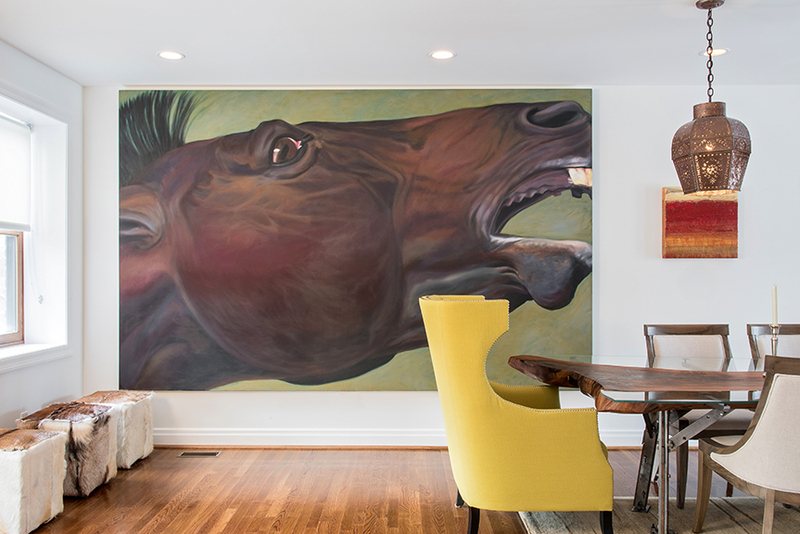 Illustrating the owners' belief that art should invoke conversation, a dramatic equine painting by Patricia Powers entitled "Decibels" dominates one wall of the townhome's main-floor dining area. 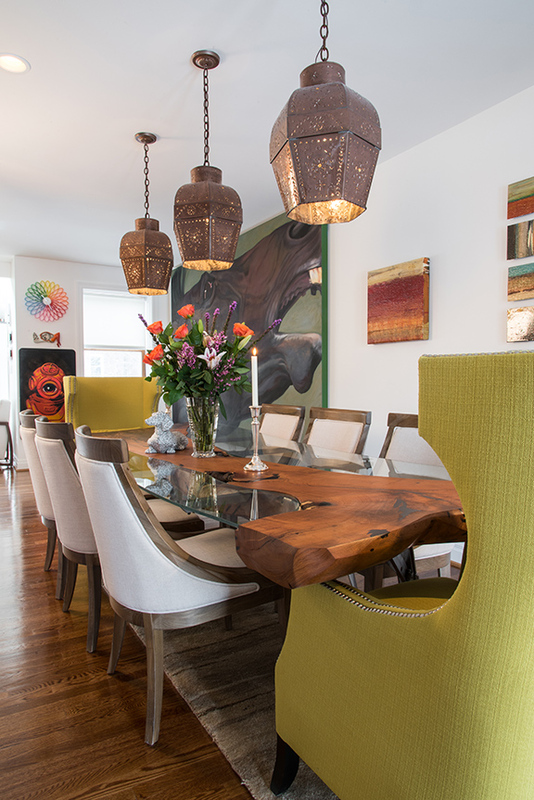 Mexican punched tin pendant lights are suspended above the 11-foot dining table, hand-crafted from a reclaimed mesquite log and surrounded by chairs from I.O. Metro. A central staircase separates the living spaces on all three floors of the townhouse. 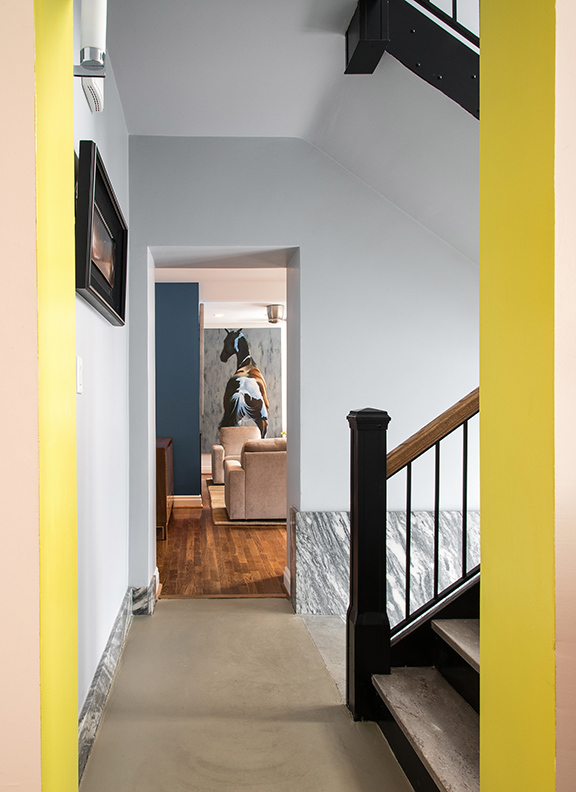 Painted in various colors, the doorjambs create a visual transition from one space to another. Comfy leather chairs invite guests to congregate in the open kitchen/dining area. Displayed on the background wall are a metal kimono by Gordon Chandler and two "box" paintings from the "Garden Series" by Korean artist Mee Shim. Neutral-toned swivel chairs focus attention on the vivid collection of artwork in the main-floor living room. Above the fireplace is "Sea Front," a Mee Shim canvas juxtaposed with a metallic acrylic by Frank Faulkner, a Powers equine painting, Jun Kaneko ceramic, antique art glass table, and a fanciful garden statue. In the master suite, a powerful abstract inspired by the Boston Marathon bombing hangs above the sleigh bed. 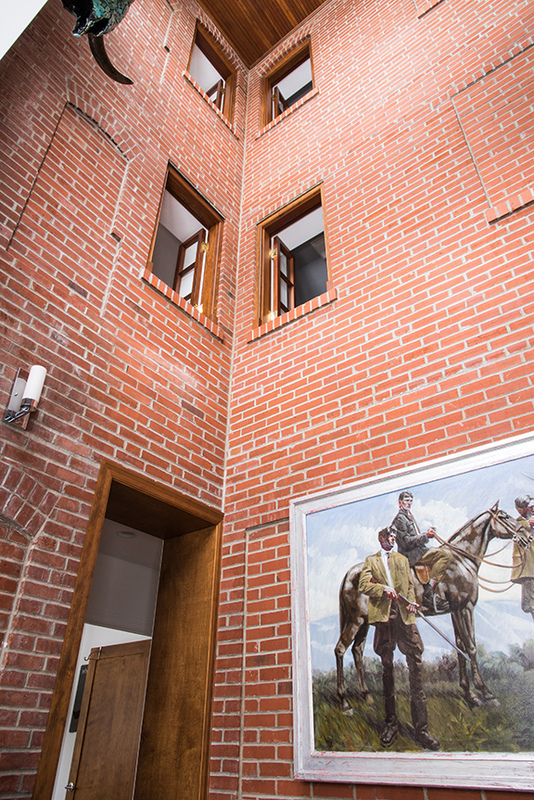 On the side wall is a 3-dimensional work by Ned Moulton depicting a horse and jockey. Furnished with an antique sofa, Felipe Bertho trompe l'oeil painting and glass-topped wicker/wrought-iron table, a sitting nook adjoins the master bedroom's atrium. 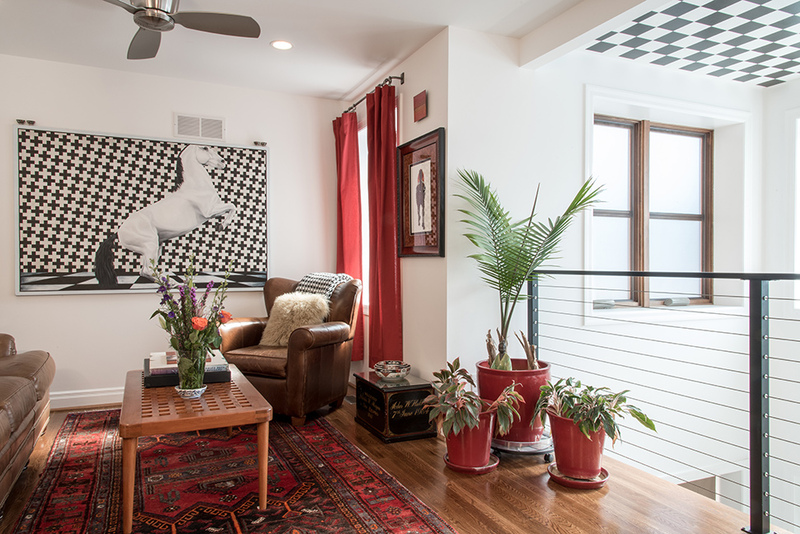 The bold geometric pattern of Powers' equine painting sets the tone for the second-floor living room, which features a "basketweave" coffee table made from a ship's teak hatch cover. Built in 1923, long derelict and often the target of vandalism, this multi-unit apartment building in Tower Grove had been an eyesore for many years. In spite of calls to raze the structure, a courageous developer undertook its rehabilitation in the early 2000s, with plans to convert the building into four three-story single-family residences. Then the housing market crashed, and construction halted. Meanwhile, John Hall and Michael Tompkins were enjoying their busy international lifestyle. Michael’s career in the hospitality and spa industry takes him around the world, and he is currently serving as chair of the International Spa Association. John’s background in finance has been similarly varied, ranging from Wall Street to the Raytheon Company. “We chose St. Louis for all of those reasons,” says Michael. “It’s a ‘real’ city, and we love it!” Tower Grove’s dynamic neighborhood atmosphere was particularly appealing, and the distinctive character of the building’s one remaining residence was the clincher. Still at the drywall stage, the unfinished townhouse gave them total freedom to design the interior. The purchase was finalized on New Year’s Day, 2014; Michael dashed off to Hilton Head for business; and John stayed in St. Louis to supervise construction. 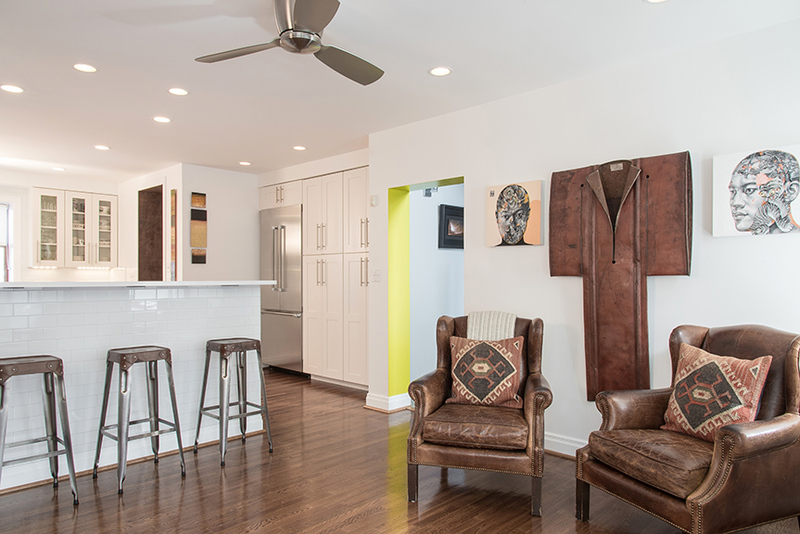 Both owners had rehabbed and flipped houses before and, in this case, they chose to finish the top floor first with a bedroom suite, full kitchen and living room. John then moved in to oversee completion of the two lower floors, with Isaac Nalick, owner of South City Construction, as the general contractor. 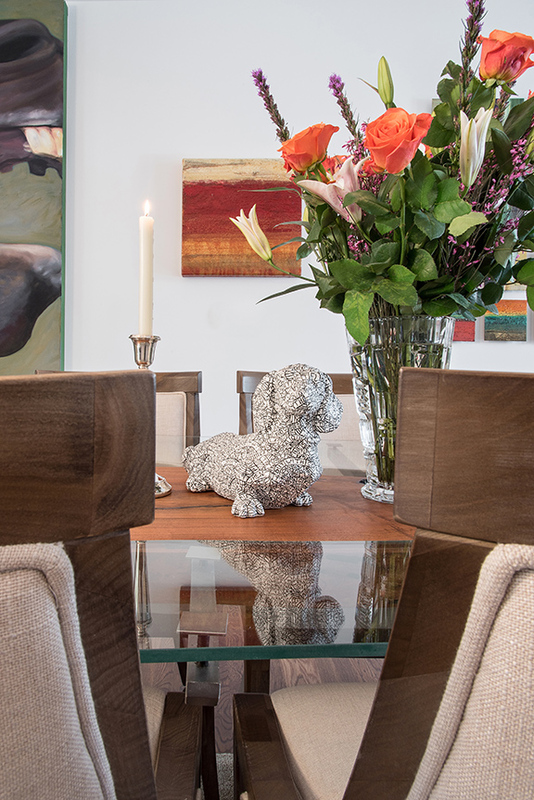 From the outset, the owners’ goal was “originality” and “fun.” Over time, they’d acquired a considerable amount of artwork and a number of family pieces, which would serve as the foundation for the home’s décor. John explained that Michael’s professional career had taught him “how to use art to beautify a space,” then added his personal philosophy, saying, “Art needs to invoke conversation.” As a result, most of the furnishings are streamlined and neutral in color, focusing attention on the vivid, intriguing art pieces. Combining a half-dozen of the original apartment units, the townhome’s floorplan is truly unique. The building’s two front bays have been converted to multi-level atriums, and a central staircase leads from the entry to the third floor, with separate living spaces on either side of each landing. Formerly apartment entries, the opposing doorways are left open, and the thick doorjambs are painted in various colors to create a subtle visual transition from one space to another. Similarly dramatic, the 11-foot dining table was crafted by Peter Kaufer, an eye surgeon and friend of the owners in Arizona, who reclaims mesquite logs from dry washes and transforms them into “functional art.” A richly textured mesquite slab forms the center of the table, with custom-cut glass defining the rectangular shape. Trim-contoured dining chairs from I.O. Metro surround the table, and lime green host chairs add a splash of color. Adjacent to the dining area, the open kitchen is a stunning contrast – sleek, high-end and all-white, with clean-lined Shaker cabinetry, Caesarstone countertops, two sinks and gleaming subway tile, accented by professional-grade, stainless Thermador appliances, including an under-counter microwave. Completing this gathering space, a ficus tree flourishes in the sunny atrium, and a small conversation area showcases a metal kimono by Gordon Chandler and two intricate “box” paintings by Korean artist Mee Shim. Across the landing, the main-floor living room is furnished with comfortable swivel chairs upholstered in a neutral, velvety fabric and grouped around a circular, glass-topped antique table. Above the fireplace, a Mee Shim canvas hangs against an azure wall, complementing the hues of another Powers equine painting on the adjacent wall. 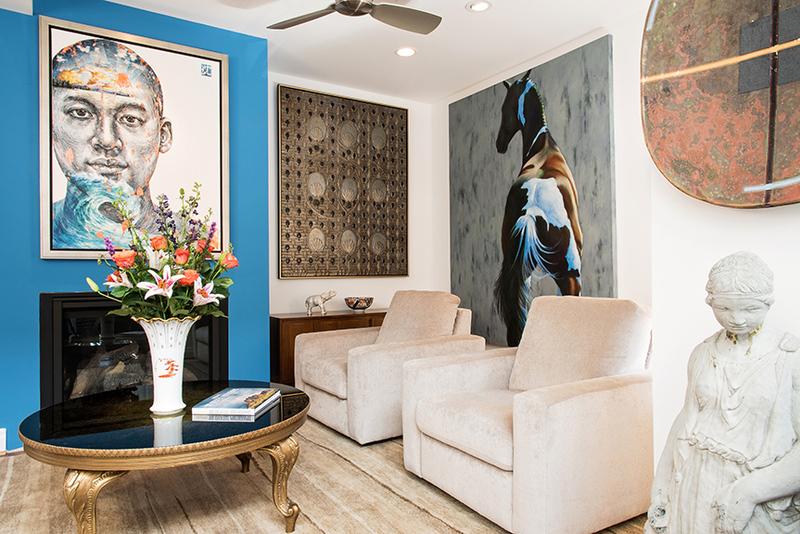 Other art pieces arrayed in the living room include four metallic acrylics by Frank Faulkner, nephew of William Faulkner; ceramics by Japanese artist Jun Kaneko; and a whimsical assortment of garden statuary. The townhome’s second floor houses the master suite, which overlooks one atrium, with an office and another atrium-view living room across the hall. Recycled barnwood lends a strong masculine design element to various wall surfaces of the open bedroom/sitting area and creates an interesting background for the artwork, including two more Powers equine paintings. 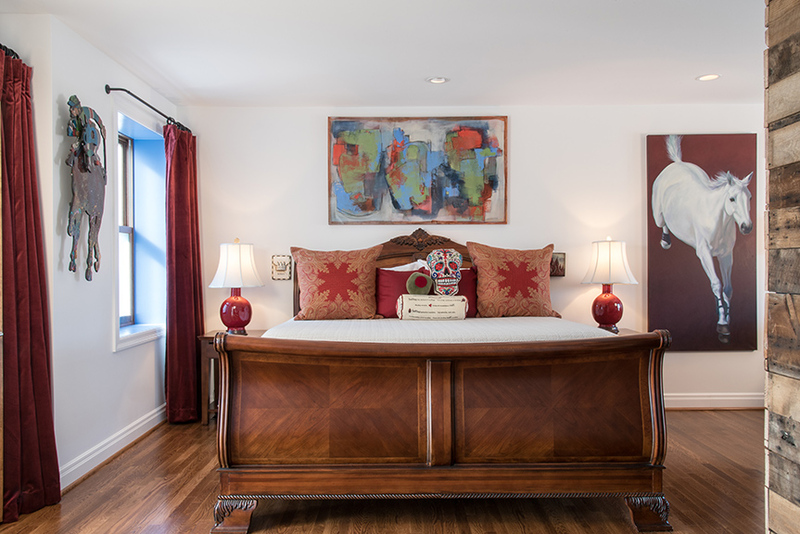 Opposite the handsome sleigh bed is an antique camelback sofa, reupholstered in claret red velvet and set on one of the home’s several colorful Pak Kazak area rugs. Inspired by the geometric background of a dominant Powers canvas, a black-and-white “checkerboard” motif sets the tone for the second-floor living room. The pattern is painted on the atrium ceiling, repeated in a deerskin throw on the leather couch and echoed by a “basket-weave” coffee table that belonged to John’s grandfather and was made from a ship’s teakwood hatch cover. John’s base of operations during construction, the third floor continues as a guest suite, complete with its own living room and kitchen, and Nalick is currently transforming the basement into additional guest quarters with a kitchenette. Future plans also call for a series of closets to be converted to a shaft that will allow for installation of an elevator. Grateful for their talent, enthusiasm and commitment, we can all appreciate the contributions these new residents are making to the Gateway City.